Good furniture arrangement is the secret to making a room look its best. Yet, most people struggle with what goes where. Who among us has not stood at the doorway to a bedroom, or the center of our living room, and wondered, “What’s wrong with this room?” We may sense that it is disjointed or awkward, but we’re not sure why. The good news is that every room has an ideal arrangement for home staging, and you can discover it by avoiding the most common mistakes. The other good news is that trial and error, or what I like to call the Fooling Around Approach to furniture arrangement, is often the best way to discover that elusive, perfect furniture plan. Even experienced decorators shove things around until they get it right, so don’t think you need to work it out on graph paper. Get some sliders, and go to work. It’s fun. 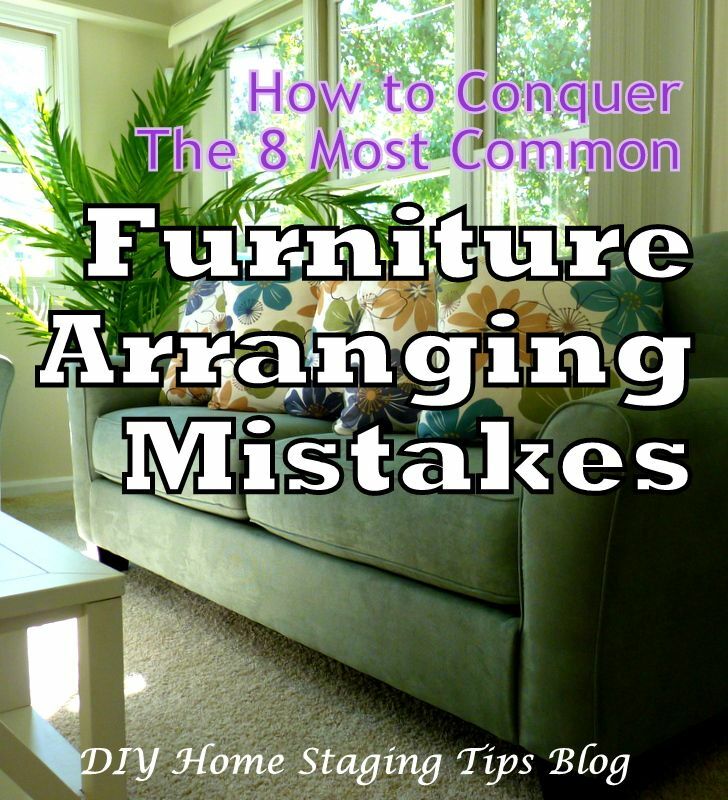 When it comes to furniture placement for home staging, these are the eight most common pitfalls to avoid. (couches, upholstered chairs, beds, bookcases) unless they are in poor condition or very dated. No one expects you to be a trendsetter, but colors and styles from a few decades ago don’t make your home look fresh and exciting. Remember that house hunters are looking at other homes and will compare your home to ones with new and stylish furniture that left them with a positive impression. 2. Not enough furniture. 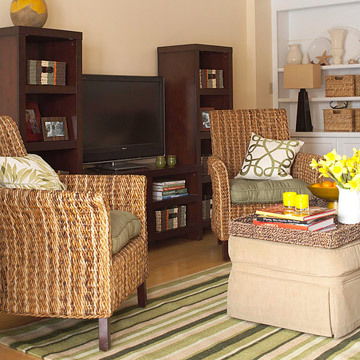 Since most people own more furniture than they use, sparse furnishing is more common when a home is unoccupied. Often a FROG – an finished room over the garage -- turns out to be a UROG -- an unfurnished room over the garage. Put some large pieces of furniture in that empty room. If it still looks a little barren, an area rug can unify the grouping that you do have. Add some shelving along the wall or as a room divider. Large DIY art on the wall will help, as well. 3. Poor traffic flow. Make sure house hunters can wander effortlessly through all your rooms. The traffic pattern should not pass through a conversation area or snake its way through the room. The walkway should be obvious, and it should look wide and unencumbered. From the entrance of the room, most of the room should be visible, and the door should open wide. 4. No purpose to the room. Each room needs to speak for itself. Will your Realtor have to say, “And this is the family room,” or will it be obvious because you’ve staged it with a game table, big comfy couch in front of the television, and a dry bar for entertaining? 6. No focal point. 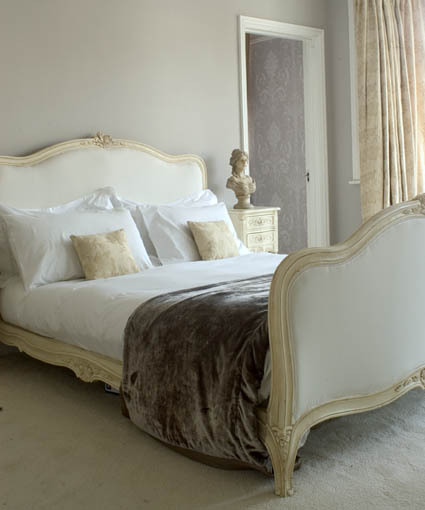 Every room needs something big that the eye goes to, something that gives a message of comfort and quality. Make your focal point something that sells your home, even if it does not convey with the sale, such as a newly slipcovered sofa visible as soon as house hunters enter the front door. A view is an excellent focal point, so arrange the furniture to showcase it. When the room has no existing focal point, you’ll need to create one. It could be a large bookcase beautifully staged, a gas fireplace, a beautiful headboard, or just a grouping of existing furniture to make a conversation area. Often the reason for a room not having a focal point is that there is too much stuff in the room. It’s common to see homes with too many small or inconsequential furnishings floating in the room or on the walls. Try removing items that don’t contribute to the look you’re aiming for. Unify small items by placing them close together, by painting them similar colors, or by placing them on a tray. 7. Furniture spread out. After you’ve decided what the function of the room is, group the large pieces accordingly – chair at the desk, table in front of sofa, or night stands at either side of bed, for example. Then, add the smaller furnishings so they sit close to the larger ones. Don’t place a tiny pedestal table by itself in a corner, or plop a small bookcase all alone at the end of the room. Think pairs and trios. Candice Olson designed this corner office, keeping everything compact, yet uncluttered. 8. Illogical placement. Ask yourself how the room works for you and your family. Use the room. If it is a guest room, spend the night in it to get a sense of how it functions. If it’s your side yard patio, plan a dinner there. Spend an evening with your favorite magazines in the living room to see if lamps are placed in the right places. Have a couple of friends over for conversation, and see if everyone can comfortably chat and have a place for a snack or drink at arm's reach. You might as well enjoy your staged home to the fullest. Soon it will belong to someone else! For more information on arranging furniture, including formulas and measurements that work for every floor plan, order my $5 ebook, How to Arrange Furniture -- A Guide to Improving Your Home Using What You Have.